NCCOS sponsored researchers with the University of South Florida and the Florida Fish and Wildlife Conservation Commission identified why red tide blooms of toxic Karenia brevis off the west coast of Florida are worse in some years than others, and predict there will be no major red tide outbreaks along Florida’s west coast in 2016. These findings are the result of three separate studies. The first study describes how the West Florida Continental Shelf – the broad, gently sloping region between the shoreline and the deep Gulf of Mexico – may be ventilated from below by deeper Gulf of Mexico water containing elevated nutrient levels and how these new waters are transported toward the coastline. The second and third studiesshow how these concepts may be combined with sea surface height measurements (via satellite) to predict red tide blooms along Florida’s west coast. 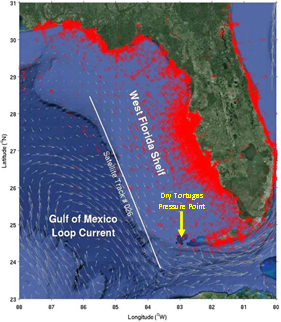 The Gulf of Mexico Loop Current interactions near the Dry Tortugas, bringnew, nutrient-rich water onto the shelf, which promotes the growth of non-toxic diatoms thatsuppress red tide development. Conversely, years without such prolonged current interactionstend to be nutrient-deplete, allowing K. brevis to outcompete other algae. The study suggests that the position of the Loop Current in spring and early summer can predict the severity of the K. brevis blooms in the fall. Based on circulation patterns and elevated nutrients in the eastern Gulf of Mexico, present conditions are favoring the emergence of benign phytoplankton over red tides. The scientists predict no major red tide outbreaks along Florida’s west coast in 2016. Together, the research findings show the importance of ocean circulation, upwelling, and nutrients in determining if and when a red tide will form along the coastline, and support NOAA’s seasonal HAB forecast in the Gulf of Mexico. The three studies were publishedin the Journal of Geophysical Research- Oceans, the Journal of Geophysical Research – Oceans, and the journal Continental Shelf Research. For more information, contact Quay.Dortch@noaa.gov.